Everyone dreams of creating the “perfect kitchen”, one that will accommodate the whole family. The reality can be very different when you need to work to a space within a home. Here’s a few kitchen ideas to help. Whether the space is a small kitchen or a large one, there are simple but clever ways to work to the best space and create a kitchen the whole family (and friends) will love. This is especially important in the small kitchen which can be a struggle. Remember cleverly designed spaces with all storage possibilities can create the perfect kitchen every time. Start by thinking of the kitchen storage you need and the area that can accommodate storage – no space should be overlooked, think outside the square. 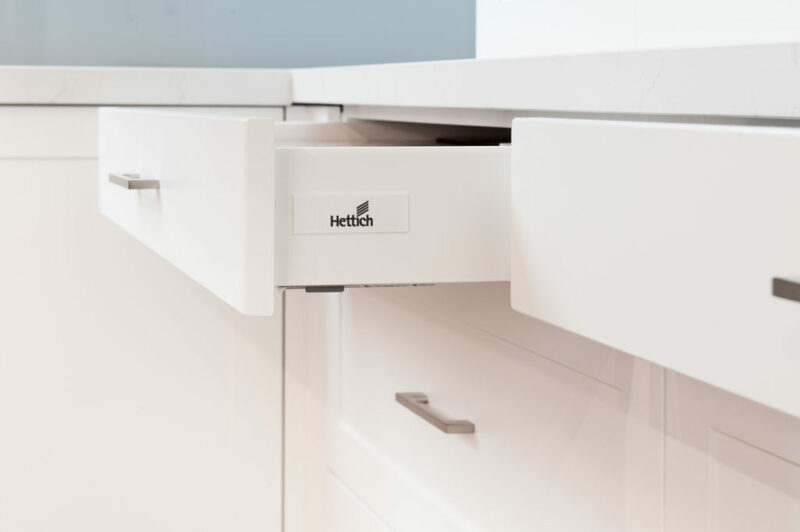 Adding internal pull out drawers inside main drawers provides tiered, clever additional storage. 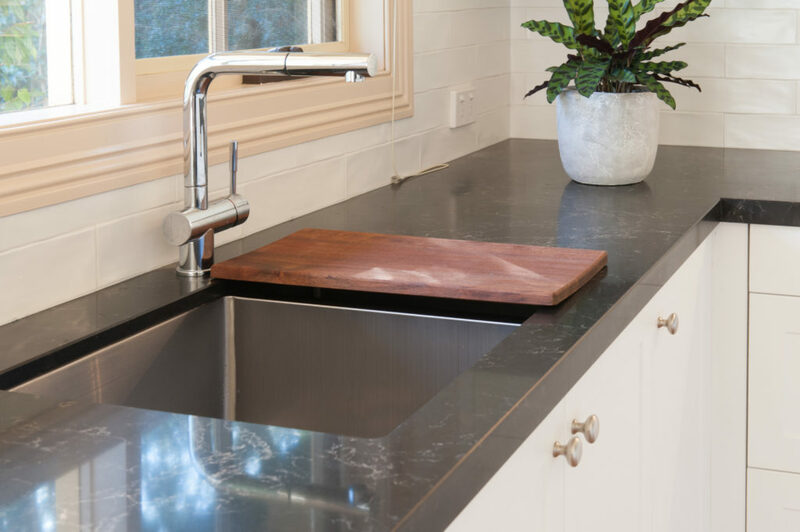 Also using a movable chopping board that is designed to sit over the sink provides the perfect solution for extra benchtop space always important in the small kitchen. 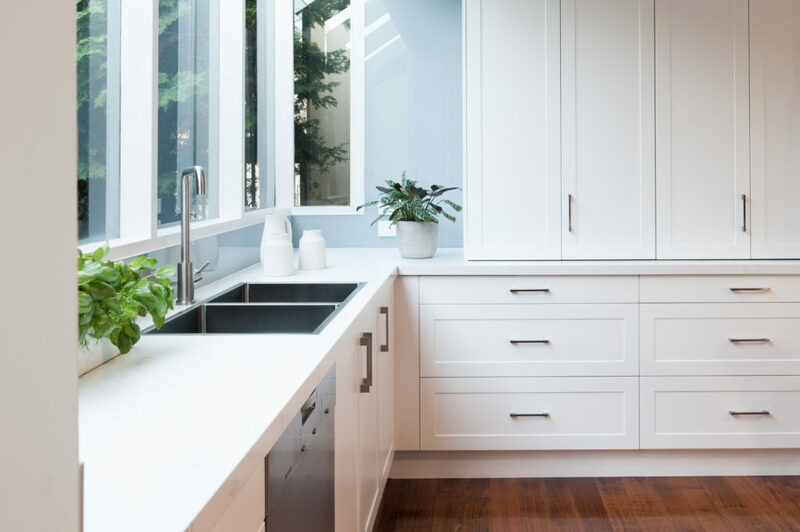 Keeping benchtops free of all objects and clutter is the secret to better utilisation of the space and providing a more open look where the kitchen will look larger than what it actually is. Other clever design accessories such as lazy susans or pull out pantry shelves that provide better utilisation of space and won’t waste space in dark corners provide a perfect storage solution. As well as storage solutions, consider painting the kitchen a bright colour to create a roomier environment. Dark colours tend to close in a space compare to brighter tones. This also applies to cabinets, benchtops and flooring to open up the room. For example, using white kitchen cabinets will create a sense of space compared to black kitchen cabinets. Of course, if you have a large kitchen space to work with the world is your oyster and pot drawers galore would be the perfect solution to hide all the clutter. Consider large pantries where you can hide all those unsightly appliances and leave the benchtops free to decorate with that lovely indoor plant or fresh herbs from the garden. Whatever your space speak to a kitchen design expert to work your needs and achieve your perfect kitchen.